It is with great sadness that we announce the passing of Alda Robichaud on Saturday, April 6, 2019 at Northumberland Hall, Amherst, with family by her side at the age of 95. 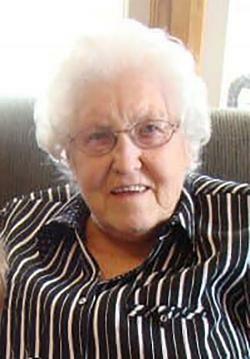 Born in Barachois, NB, on August 4, 1923, she was the daughter of the late Patrick and Basilice Melanson and is the last surviving member of her family. Alda worked at the Maritime Pants Factory and later at Atlantic Wholesalers. She loved sports including badminton, bowling and hockey. She was an avid fan of the Montreal Canadians and the Amherst Ramblers. She was a member of the CWL for over sixty years. She also loved to play cards with family and friends, especially with her grandchildren. Alda greatly enjoyed summers at the family cottage at Patterson Beach in Linden. She will be dearly missed by her family and friends. Besides her parents, she was predeceased by her husband, Raymond; sisters, Philomene Vautour, Eva Boudreau, Evangeline Cormier, Florine Vautour and Sister Marie Rose Melanson and brothers Jude and Ephiem Melanson. She is survived by her children, Ken (Verna), Linda (Roger) Lewis, Wayne (Debbie), Roger (Jeannine) and Ann (Jack) Hayes. Alda is also survived by ten grandchildren, Lisa (Troy) McEachern, Kari (David) Bradford, Ellen (Robert) Bay, Jennifer (Robbie) Burbine, Brad (Kim) Robichaud, Beth (Dave) Robichaud, Mitchell Robichaud, Cory (Robin) Robichaud, Lucas (Megan) Hayes and Caleb Hayes. Also surviving are fourteen great-grandchildren, Hayden, Leah, Alyssa, Emily, Michael, Simon, Abby, Matthew, Cameron, Henry, Connor, Jeremy, Jackson and Lincoln, as well as many nieces and nephews. She was blessed with special friends Deen Crowe and Linda Terrio. The family would like to thank the staff at Northumberland Hall for their wonderful care and support. Cremation has taken place under the direction of the Jones Family Funeral Centre, 70 Church Street, Amherst (902-667-8777) from where visitation will be held on Wednesday, April 10, 2019 from 2-4 and 6-8 pm. Parish prayers will bed held at 7:30 pm. Funeral Mass will be held at Holy Family Parish on Thursday, April 11, 2019 at 11 am, with Father Craig Christenson presiding. Burial will be at St. Charles-Nativity Cemetery in the spring. If so desired, donations may be made to the charity of your choice. Sharing of memories and condolences may be sent to the family by visiting Alda's online memorial at www.jonesfamilyfuneralcentre.ca or through the Jones Family Funeral Centre Facebook Page.